Use the radio quicklinks below to jump to an item of interest or simply browse down the page. Italian inventor Guglielmo Marconi (pictured at right) first developed the idea of a radio, or wireless telegraph, in the 1890s. His ideas took shape in 1895 when he sent a wireless Morse Code message to a source more than a kilometer away. He continued to work on his new invention, and in 1897 he received the official British patent for the radio - which was really a wireless telegraph system at first. Other inventors in Russia and the United States had been working on similar devices, but Marconi made the right political and business connections to gain the first real success with the device. By 1900 there were four competing wireless systems. In the years just before World War I, scientists at companies such as American Telephone and Telegraph, General Electric, and Westinghouse and inventors - including Reginald Fessenden, Lee De Forest and Cyril Elwell - were mapping out ways they could develop the potential of wireless communication so it could broadcast more sophisticated messages than the dots and dashes of Morse Code. By 1914, Fessenden, a Canadian who was once employed in Thomas Edison's labs, had worked with General Electric to build alternators that could sustain a consistent broadcast wave powerful enough to transmit voices and music over thousands of miles. Radio was developed for its military applications in the pre-World War I years, and the U.S. Navy held the patents. In 1919, Marconi’s resources were sold to General Electric and with that Radio Corporation of America (RCA, which spawned NBC Radio) - led by former Marconi employee David Sarnoff - was formed. 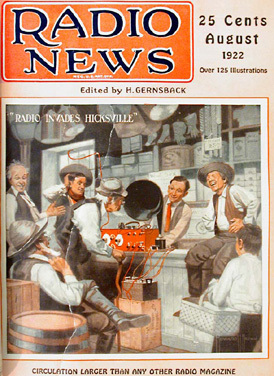 The radio boom began, as people found it indispensable for receiving news and entertainment programs. RCA's stock price went from $85 in early 1928 to $500 by the summer of 1929. The stock market crash of 1929 dropped it down to $20 per share, but tough economic times of the 1930s couldn't stop the well-developed NBC network. The development of a vast array of programming choices in the 1930s brought the "Golden Age of Radio," and by 1939 nearly 80 percent of the United States population owned a radio. In the boom of the 1920s, people rushed to buy radios, and business and social structures adapted to the new medium. Universities began to offer radio-based courses; churches began broadcasting their services; newspapers created tie-ins with radio broadcasts. By 1922 there were 576 licensed radio broadcasters and the publication Radio Broadcast was launched, breathlessly announcing that in the age of radio, "government will be a living thing to its citizens instead of an abstract and unseen force." As with television in later years, however, entertainment came to rule the radio waves much more than governmental or educational content, as commercial sponsors wanted the airtime they paid for to have large audiences. Most listeners enjoyed hearing their favorite music, variety programs that included comic routines and live bands, and serial comedies and dramas. Broadcasts of major sports events became popular as the medium matured and remote broadcasts became possible. Radio was a key lifeline of information for the masses in the years of World War II. Listeners around the world sat transfixed before their radio sets as vivid reports of battles, victories, and defeats were broadcast by reporters including H.V. Kaltenborn and Edward R. Murrow. Franklin D. Roosevelt (at right), Winston Churchill, Adolph Hitler and other political leaders used the medium to influence public opinion. "If the invention was what he believed it to be, our mariners would have been given a new sense and a new friend which would make navigation infinitely easier and safer than it now was." "All the nations of the earth would be put upon terms of intimacy and men would be stunned by the tremendous volume of news and information that would ceaselessly pour in upon them." "...As far as I can judge, I do not look upon any system of wireless telegraphy as a serious competitor with our cables. Some years ago I said the same thing and nothing has since occurred to alter my views." A June 1920 article in Electrical Experimenter titled "Newsophone to Supplant Newspapers" reported on an idea for a news service delivered via recorded telephone messages and also predicted the "radio distribution of news by central news agencies in the larger cities to thousands of radio stations in all parts of the world" leading to a time when "anyone can simply listen in on their pocket wireless set." "De Forest has said in many newspapers and over his signature that it would be possible to transmit human voice across the Atlantic before many years. Based on these absurd and deliberately misleading statements, the misguided public...has been persuaded to purchase stock in his company..."
De Forest was acquitted, but the judge advised him "to get a common garden-variety of job and stick to it."